Thermocouples convert thermal potential variation into electric potential variation. An electromotive force is generated when the ends of 2 wires of dissimilar metals are joined at a temperature other than 0°C (hot junction) while the other ends (cold junction) are set at 0°C (real or compensated value). The thermocouple wires are insulated with mineral powder inside a flexible protecting sheath. The thermocouple wires are protected by rigid insulators placed in a metallic or ceramic protecting tube. The thermocouple is a cable. The hot junction may be protected by a capsule. The nature of the insulating materials and protectors depends on the working temperature and environment. Grounded: with single or dual element. This provides fast response with protection from the process. 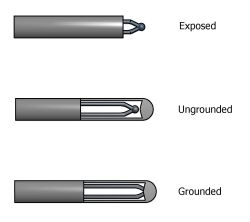 Ungrounded: Improved protection from interference that may be picked up by the sheath. Response time may be slower. Exposed: Very fast response time. Not suitable for many processes because of corrosion.